Doctors don’t go into dentistry because of a passion to be a CEO. Dental schools do not confer MBA degrees. 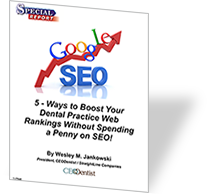 Yet, most dentists build or join dental practices that are essentially small businesses. Every day, they are confronted with issues and systems (marketing, financing, HR, etc.) that can make or break the practice. Many make bad decisions or avoid making decisions altogether. The result? Struggling or stagnant dental practices and stressed-out dentist-CEOs. Get to the core of your personal and professional goals. Build a solid plan to meet those goals. Support you and your team through the implementation of the plan and its related systems. Keep you on track to stay with the plan, fine-tune your systems and continuously improve your practice. Take control of your dental practice today and free yourself to enjoy your work once more. You, too, can fall in love with dentistry, all over again! Contact us today and let’s explore how we can help you grow your practice.